See what some of our former guests have to say about our I Go Maui Vacation Rentals & Realty vacation rentals. Feel comfortable that you will get a great experience when staying in our Vacation Homes. Amazing! We booked a last minute trip to Maui the booking process was simple and smooth. The instructions given to us were perfect, they even went to the condo and turned a light on for us since we had a late flight. The condo was perfect. It had an amazing view, great Tradewinds, a small beach in front that you can hangout on. The bed was comfortable and condo was stocked well with towels, kitchen items, etc. The ice machine worked really well too. We didnt need to buy ice for the cooler even though we did. It was centrally located to Kihei and Lahaina. There is a bigger beach to the left of the small beach that you can walk to if you would like. This condo is by far the favorite place that we have rented from. I highly recommend staying here if you are wanting to visit Maui. We would definitely stay again. We really enjoyed our stay. The accommodations had everything we needed and we were just steps from the water and a beautiful beach. It was also nice to have shopping and restaurants nearby. We also appreciated all of the communication and support we got regarding Hurricane Lane. Although the weather did not get too severe, the rental company was willing to help in any way they could. We had a wonderful time on Maui and would gladly use this property again in the future. Mahalo!!! Great location My family and I loved the location. It was just outside of the busy areas and our quiet complex was perfect to come back to after a busy day. Thanks so much! As advertised!!!!! We had a wonderful experience at this condo. It was a home away from home. Very clean and well supplied. Very quiet. Very comfortable. We would stay here again. Going down to the shore to see the sea turtles was awesome!!! Thanks for the memories!!! Scenary to Envy! 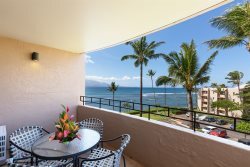 First of all, you walk into a beautiful condo and are greeted by stunning views of an azure ocean, swaying palm trees and Haleakala from the lanai. You are at once, at peace and tranquility. Andreas has all rooms beautifully appointed, the kitchen has everything one needs, and the little touches are greatly appreciated. We loved Maalaea for its beauty, quietness and ultimate friendliness. We are already planning our next trip. You must come here! Best View Loved the Location! We Loved it!!! Beautiful View! Loved the quiet location! I loved have all the comforts of home that you dont get in a Resort! Would DEFINITELY Recommend and will Definitely stay there again!! Super clean unit and loved the Beach our front and just down the road had awesome snorkeling! Breathtaking Ocean Views! This condo was perfect for my family and I. The two bedrooms are so separated from one another for ultimate privacy. Sleeping to the sound of ocean waves and waking up to a stunning sunrise every morning was pure bliss. The location was perfect. It was a quick 5 minute walk to a gentle beach that was great for my 2 year old and for snorkeling! Also within walking distance to multiple activities such as whale watching, dinner cruise, the marine center, and a few restaurants. To be honest though we saw more whales and sea turtles straight from our lanai! I have zero complaints about our 10 day stay at island Sands! Mahalo! Great stay for the money. My wife and I stayed her for about a week during our honeymoon and really enjoyed it. It was nice to have a few restraunts less then a mile away and the beach just steps from the front door. The property manager was also very accommodating, any questions we had about our stay he was very quick to answer. A amazing stay! We had an amazing stay! The room was perfect and had everything. The location was pretty good. Whoever is reading this, I hope fall in love with Maui like I did. Have a great vacation. Enjoyed our stay We thoroughly enjoyed our stay. It was a great location to wander on the beach, see the eco reserves, and take off on journeys around the island. Beautiful touring! We were very comfortable and enjoyed the grill and relaxing by the water. Thanks!